The design of the HUMA brand‘s website. Below you can see the initial design of their homepage. 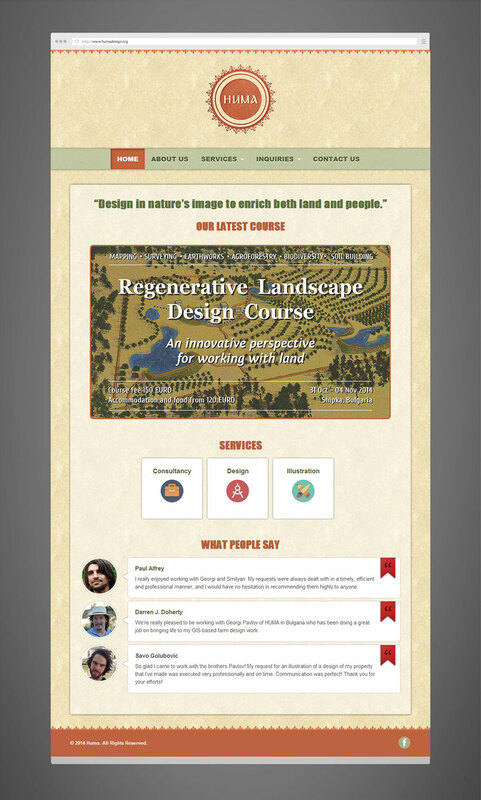 The company delivers regenerative landscape design services and in the same voice as the rest of their branding, the website communicates earthiness, warmth and friendliness. For more details on the branding, please visit this page. The page structure starts with brand recognition (the logo and name), followed by the main navigation and a statement of purpose. Then, the latest of their courses is advertised as a main interest for students. This is followed by additional services and testimonials to strengthen the company’s credibility and work ethic. The main purpose for the design was to create a strong brand recognition. The information presented clearly helps the company interact and efficiently communicate new events, courses, research articles and projects to their customers. Some of the key modules include a store, inquiry forms for specific services, gallery of projects and section for new courses to be advertised. We are currently working with HUMA to create a system for their online courses – to both sell and host them.